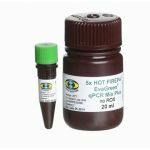 HOT FIREPol® EvaGreen® qPCR Mix Plus (no ROX) is an optimised ready-to-use solution for real-time quantitative PCR assays, incorporating EvaGreen® dye. 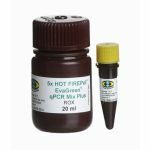 It comprises all the components necessary to perform qPCR: HOT FIREPol® DNA Polymerase, ultrapure dNTPs, MgCl2 and EvaGreen® dye. The user simply needs to add water, template and primers. HOT FIREPol®DNA Polymerase is activated by a 15 min incubation step at 95°C. 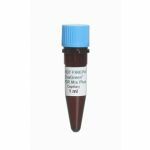 This prevents extension of non-specifically annealed primers and primer-dimers formed at low temperatures during qPCR setup.